Mark Webber took victory at a dry but enthralling British Grand Prix after passing Fernando Alonso for the lead four laps from the end of an intense strategic battle between Red Bull and Ferrari. Alonso led the race until lap 48 when Webber passed the Ferrari around the outside into Brooklands. The move was a long time coming as Alonso was on soft tyres in the final stints while Webber enjoyed more sustained pace on a set of hards. Sebastian Vettel came through for third after a fairly quiet race, ahead of Felipe Massa and the Lotuses of Kimi Raikkonen and Romain Grosjean, who showed impressive pace to come back from a broken front wing early on. Michael Schumacher dropped from third on the grid to seventh at the finish and Lewis Hamilton also had a disappointing race as he finished eighth. McLaren appeared to make a strategic error by bringing Hamilton into the pits early for his second stop in attempt to fend off Grosjean. Bruno Senna and Jenson Button took the final two points positions in ninth and tenth. The strategic fight was set up at the start of the race because the dry conditions allowed drivers to choose their starting tyre compounds. Alonso and Hamilton were the only two of the top ten to opt for the hard compound tyre, and it turned out to be the wrong choice as the final stint on soft tyres cost Alonso. The race got off to a frantic start with a lot of action taking place in the opening five laps. 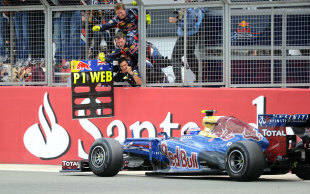 Vitaly Petrov failed to take the start after an engine problem, but when the lights went out Alonso defended robustly from Webber, while further back Massa got ahead of Vettel for fourth place. Paul di Resta's race came to a very early end as he clipped Grosjean's front wing. A right rear puncture spat di Resta off the track and caused enough damage to force his retirement, while Grosjean had to pit after losing out in a good battle with Button and Kamui Kobayashi. The Lotus was quick in clear air at the back, but further forward Schumacher's Mercedes was not fast and he was holding up Massa, Vettel and Raikkonen behind. That allowed Alonso and Webber to pull a gap before the first pit stops as the race settled down, with Massa taking until lap 11 to find a way past Schumacher in to Brooklands using DRS. A few laps later and Brooklands was the scene of another Pastor Maldonado crash. Sergio Perez attacked the Williams - which had just pitted - around the outside but Maldonado understeered in to the side of him, taking Perez out of the race as the pair spun. Vettel was one of the first to pit and used the undercut to jump Schumacher and Massa in to third place, but was never really in contention to challenge the leaders from there. Hamilton took the lead at one stage having done a long first stint on hard tyres, but a short second stint on softs betrayed McLaren's strategic error and dropped him behind Schumacher and Raikkonen, with the Lotus showing strong pace once it got in clear air. The DRS zone on the Wellington straight facilitated overtaking and saw the quicker cars moving through the field. It was on the final pit stops that the race swung, with Alonso having to put on soft tyres for a final 15-lap stint. After some initially encouraging laps, Alonso then slipped back towards Webber and lost the lead four laps from the end before showing enough pace to secure second. The action continued further down the field, with Kobayashi locking up when pitting and taking out four members of his pit crew. The incident dropped him just behind a close battle for ninth between Nico Hulkenberg, Senna and Button, and Hulkenberg lost out with two laps left when running wide at Copse trying to retake a position from Senna. The forecast rain never came, but the race was still great entertainment for the 120,000 capacity crowd which made it in to the circuit and the result sees Webber close to 13 points behind Alonso in the drivers championship.